It's mid-winter, are we getting tired of sweaters yet? Maybe a little. 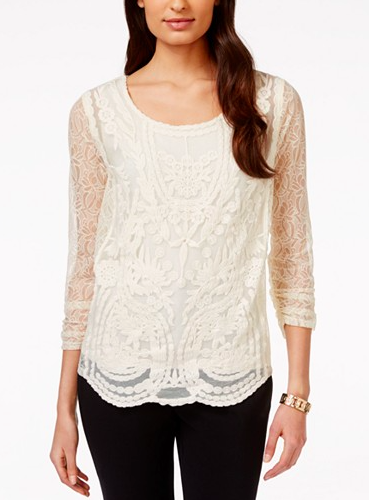 Why not mix it up with some feminine lace? I love lace for winter because its unexpected. You may think it's too chilly for lace, but layer it up! I've picked out some great long sleeve options that you can wear alone for date night or layer it with a blazer for work. So many wonderful things happening here, the first of which is the matching camisole is included. What else? Stand up collar, scalloped hem, and trumpet sleeves. Pair this with pearls and wool pencil skirt or have some fun with a neon statement necklace and jeans. 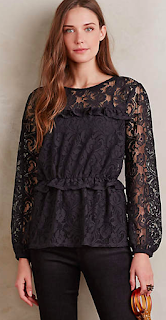 I love this oversized lace pattern. 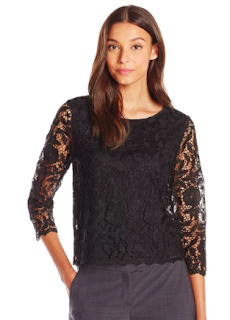 Very well designed with a scoop neckline. 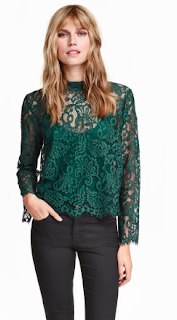 A new take on a simple lace blouse. An elastic waist cinching at your smallest part. Traditionally winter might be sweater weather, but why not try some lace? It's not just for spring and summer. Mix it with a moto jacket or black denim to toughen up the feminine look.